Transdev-owned Harrogate Bus Company has unveiled its vision of creating a low emission bus town on the back of its commitment to introducing eight full-electric Volvo 7900e buses which is due next year. The electric bus investment is backed by £2.25million from the OLEV Low Emission Bus Scheme, including £815,000 for the infrastructure which comprises three opportunity charging points in Harrogate bus station. The electric fleet will operate on routes serving the Bilton, Jennyfield and Pannal Ash areas of Harrogate. And the operator is also investing £250,000 in retrofitting emission control systems on buses serving Route 1 Harrogate-Starbeck-Knaresborough and will also upgrade with new interiors featuring USB charging, fast wi-fi, countdown to destination screens and audio visual announcements. “We have a five year vision to transform the bus experience in Harrogate,” says Alex Hornby, CEO, Transdev Blazefield. “Our plans have the potential to grow usage by doing more of what customers and non-users tell us they want. “Creating a low-emission bus town, involving the world-class development of new generation, 100% electric buses is just one element of our strategy, which also includes further innovations in ticketing and new standards in ride comfort including fleet-wide wi-fi, USB charging and next-stop information. “We are also keen to enhance our role in the borough by developing advanced relationships with councils, employers, schools, retailers and attractions, as well as improved integration with other transport providers by bus, rail and air. One of Volvo’s 7900e electric buses which operate in Gothenburg was brought to Harrogate for the launch this week. “These buses will help us to make Harrogate a UK leader in clean, green public transport,” adds Hornby. 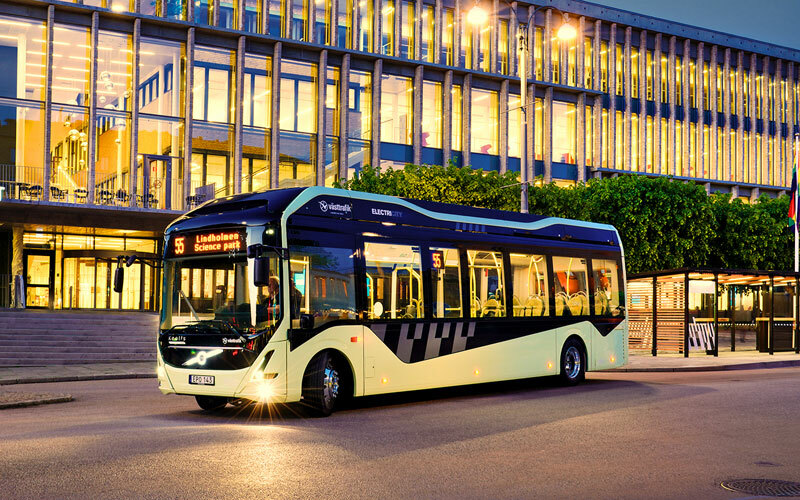 “We’re delighted to welcome a zero-emission 100 per cent electric Volvo bus, currently in use in Gothenburg, to illustrate how these groundbreaking new vehicles will set the pace for public transport in Harrogate.